Even as our winter wanderings wind to a close, we never forget that we must find new and exciting wines to serve to guest at our Cape Cod Bed and Breakfast when we reopen in May. We plotted our return route to include meeting friends in the northern Virginia wine county. We spent Friday night at a very nice RV park in Harper’s Ferry, West Virginia just across the Potomac River from Loudoun County Virginia. The next morning was cool and overcast when our friends Bob and Noreen, who live outside of Washington, D.C., picked us up for our wine adventure. Our tour guides, past guests at our Sandwich Inn and Virginia wine aficionados, prepared us for our day by providing state wine maps and a wonderful booklet, the DC’s Wine Country, Loudoun, VA. Touring Guide, published by the Loudoun Convention and Visitors Association, a must for a first time visitor. As always, I had done a little research myself and was amazed to learn that there are almost 200 operating wineries divided amongst Virginias’ six American Viticultural Areas (AVAs). 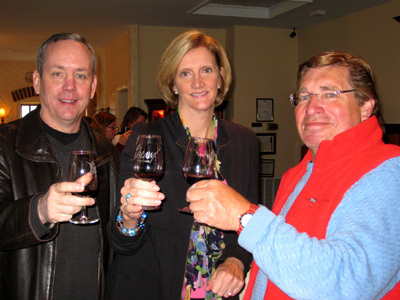 Loudoun County is in the Upper Northern Virginia district and home to twenty-two wineries/vineyards. What an opportunity to gain exposure to Virginia wines. Our experienced friends drove us through the rolling hills with miles of grape vines, trellised and pruned, awaiting spring. Our first stop was Breaux Vineyards, one Virginia’s largest vineyards with over 100 acres planted with 18 different varietals. We arrived a little before 11:00 am and were the first car in the parking lot and the first guest to enter the Mediterranean style tasting center. Our tasting of the eleven wines offered started quietly in the spacious tasting room, but shortly after, as we worked our way through the whites, the calm was shattered as limo loads of young DC urbanites on chauffeured wine tours descended upon Breaux. Our hostess, Katie, stayed with us and guided us through the reds, including a comparison of the 2005 and 2006 Nebbiolo, by far Breaux best wine. I also enjoyed their sweet desert wine, the 2009 Nebbiolo Ice. Since this was our first stop, we held off making any major purchases, but got all the shipping information we needed for the future. Noreen skillfully kept us ahead of the crowds, which may have also been slowed by the intermittent downpours. The rain did not dampen our enthusiasm for discovering more wines as we worked our way across Loudoun County. Our next stop was at the Hillsborough Vineyards, a wonderful setting built into the steep valley slopes. I am glad we were not it the RV, as it would not have been an easy climb and there would have been no place to park or turn around. The seated tasting was held in the 1840s barn where we were served plated cheese and chocolates to accompany the wines. Most of the wines were from grapes that I had never heard of and could not pronounce, but they were very nicely presented in flights of two for easy comparisons. We did buy a nice late-harvest Viognier, the 2008 Moonstone. I was surprised to find I like the sweet desert wines from Virginia. Next, as the sun broke through and the sky cleared, we made we made our way to Sunset Hills Vineyard, positioned in the foothills of the Blue Ridge Mountains. The tastings are in a 140-year-old barn that was recently restored by a family of six Amish brothers. The 8,000 square foot barn features a stunning 35-foot cathedral beamed ceiling. 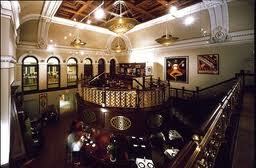 As I recalled, the tasting room was much more impressive than the wines, all of which seemed light to me. However, all of the vines are newly planted and they have only a few vintages behind them. As the rains started again, we made our way to Loudoun Valley Vineyards a short way down Va. State Route 9. This small vineyard’s tasting room is housed in an unassuming low building that matched the wines served. The most interesting thing was they offered their tastings in short stem less glasses, which some people think is not the best idea since your hands contact on the glass changes the temperature of the wine. Our last stop was a very new winery, 8 Chains North, just opened this year. The owner/winemaker, Ben Renshaw, was the winemaker at Sunset Hills Vineyard before going out on his own. I liked some of the reds and think in a few years I would like to revisit this work in progress. 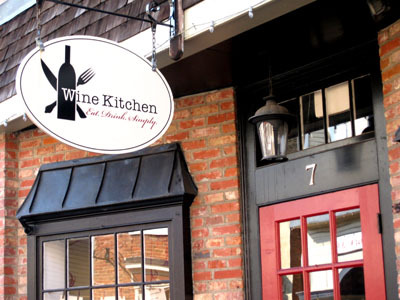 After hours of tastings, we headed to Leesburg for a late lunch at Noreen and Bob’s favorite restaurant, the Wine Kitchen. Oh what a treat we were in store for. "The Darth Vader of the wine universe – powerful, brooding and with merciless flavor. Dark notes of blackberry and anise create a deep bottomless boom James Earl Jones would be proud of. A shiny black helmet of licorice encapsulates notes of roasted coffee and dark chocolate that emerge breathlessly (hahhh pahhh) with each swirl of the glass. A finish that at first seems a bit aggressive and upset at the universe, but then fades quietly like a penny falling down a well, gently bouncing off the sides of your mouth." I am not sure what it all means, but the wine was great. After the Wine Kitchen, we had a nightcap at the Lightfoot Restaurant. Located in the turn-of-the century People’s National Bank, it’s wine is stored in the large bank vault that the bar is built around. It was a great end to a great day. With hundreds of more wineries yet to see in Virginia, we will be stopping next year on both are way to and from Florida. Charlie Preus, the Innkeeper’s Assistant and Wine Steward at the 1750 Inn at Sandwich Center, Sandwich, Cape Cod Massachusetts.